Now with a pretty new cover to coordinate with matching picture book and advent calendar! When Mary and Joseph are told they have to go to Bethlehem, who will carry Mary on the long journey? And when Herod’s soldiers come looking for them, who will help them escape across the desert to Egypt? 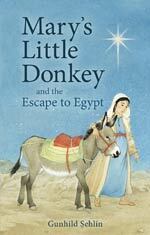 A little donkey who has met gentle, kind Mary and his world changed forever. This exciting and beautifully told version of the Christmas story gives a unique, child-friendly perspective on this ageless tale. With 14 black-and-white illustrations. Ideal for family reading through the Advent season, enjoying a page or two after opening the next door Advent calendar each night. A wonderful ritual to begin when your oldest is about four. Younger children will be captivated by the interest of the eldest and can fully participate in this lovely evening ritual. Our family reads this story each year, with the journey to Bethlehem taking up the 24 days of advent and the flight to Egypt for the 12 days of Christmas. I still can’t think of a better, or simpler, way to celebrate this time of year. 144 pages, 5 1/2″ x 8 1/2″, 2012.